I’m beyond thrilled to present to you the first ever post of the Salt-Free My Recipe series. Today’s make-over is brought to you by none other than our good friend Mark Bittman (who always comes through in a pinch) because the submission box was a bit bare this week. Ahem, ahem. So for future posts, don’t let Mr. Bittman have all the fun (or hog the spotlight) and remember to email sodiumgirl@gmail.com or comment below with your salt-free recipe challenges. Last night, our wonderful blogger group (which continues to grow by leaps and bounds) met up for a Mexican fiesta of sorts. The inspiration for the meal was a recipe from Chow.com for zucchini blossom tacos. More instruction on how to make these treats and others from the blogger consortium will come in the following week. So hold on tight. Since I was hosting the grand event, I decided to make an additional dish to kick off the meal. I remembered eyeing a recipe for a cold avocado soup on Mr. Bittman’s blog: it was creamy, brightly colored, and incredibly simple. The summer starter only required five ingredients: avocado, milk, cayenne pepper, salt, and lime. And even better, Bittman offered the option to add shrimp or lumpy crab meat to the mix, which would give the dish extra texture and depth and would, taking it from guacamole to “holy moly!” I couldn’t imagine eating this soup without the balance provided by the seafood. But as you are well aware, there’s always a low-sodium catch(-of-the-day). 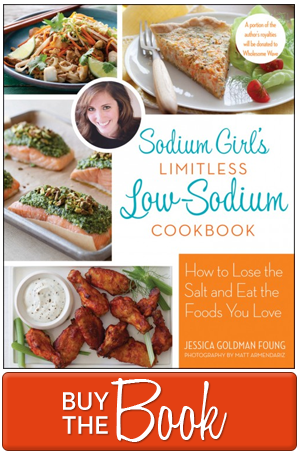 Instead of launching right into my suggestions for sodium-free substitutions, let me pause for a brief moment and give you time to spot the sodium road blocks. Think of it like those photo games you find in magazines (or sleazy dive bars) where you have to compare two pictures and find the differences. Tick tock. Time’s up. To start, yes, you are correct. Salt definitely must be nixed from this recipe. So get rid of that and add a few shakes of cumin and black pepper in its place. 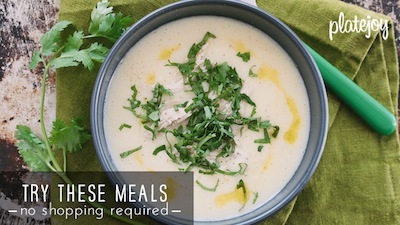 I used unsweetened coconut milk, and even though I was worried about it tasting too sweet, the end result was quite mild and the milk successfully thinned out the consistency of the soup. And for the third and final sodium offender, you hit the nail on the head again. Crab, weighing in at almost 1000 mg of sodium per serving, definitely must be removed. To mimic its luscious and lumpy texture, I fried some tilapia filets, coating them first in cumin and smoke paprika. 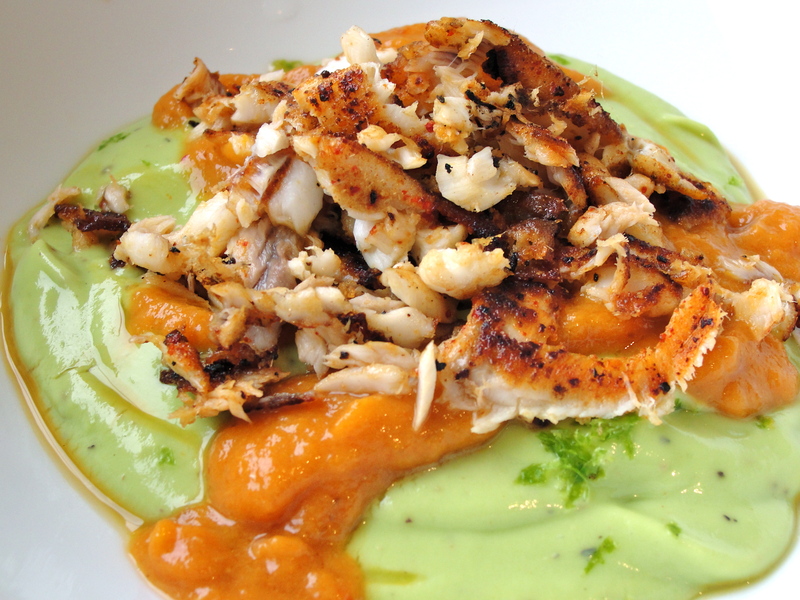 This particular white fish is a great substitution for crab as it crumbles easily and takes on a similar look and texture. And while the taste may not be exactly the same, at least your fish is cheaper. So there you have it folks: a simple, satisfying, and sodium-free version of Mark Bittman’s Cold Avocado and Fish Soup. It takes under thirty minutes to make, and as it was tested last evening, I can guarantee that it is an impressive way to start a party. 1. Put the peeled and pitted avocado in a blender (or use your immersion blender and a tall container). 2. Add half the coconut milk, a large pinch of pepper, a small pinch of cayenne, and a shake of cumin. Process to a purée. 3. Beat in the remaining milk by hand, then chill for up to 6 hours if you have time (Bittman advises: press a piece of plastic wrap onto the surface of the soup so it doesn’t discolor). 4. In a medium sized pan, heat sesame oil over medium-high heat. 5. While oil is getting hot, season your tilapia filets with cumin and smoke paprika. 6. Add the fish to the pan and sear the filets, five minutes each side. 7. To plate, taste and adjust the seasoning of avocado soup if necessary, and add the citrus juice if you’re using it. 8. 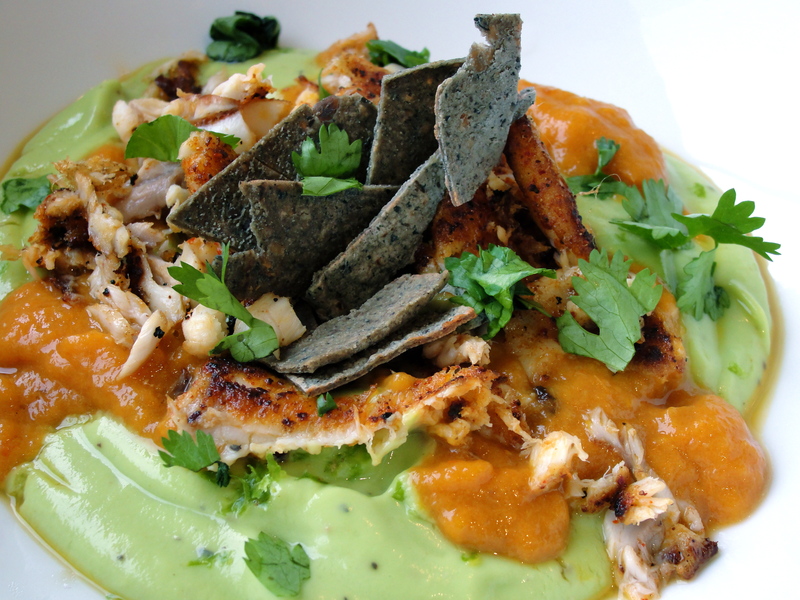 Put about a cup of avocado soup in each bowl and place your tilapia (slightly shredded and pulled apart) on top. 9. For additional garnish: toast some blue corn tortilla strips (0 mg of sodium); make your own roasted red pepper sauce (o mg of sodium, 15 minutes of your precious time); and add a few sprigs of cilantro. Hi Waiwa – I totally agree with you on the guacamole thing. I have to admit, when I first tasted the “soup” without the fish, I wasn’t a big fan. But after adding a bit more coconut milk, some home-made red pepper sauce, and the fish, I absolutely loved the texture and found all the ingredients to compliment each other. This is definitely not a dish I would whip up on any old weekend evening. It is different and that’s what makes it special. I think it is perfect for brunches and other special occasions. So give it a try and let me know what you think. And if it is still too thick for you, grab a bag of chips and call it your seafood guacamole dip. Chow on. I was a little skeptical about the avocado soup too but was pleasantly surprised that it is definitely different from guac. I thought it was amazing and such a refreshing treat! Love it! This looks amazing! And I’m absolutely thrilled to discover another great recipe that uses So Delicious coconut milk. That stuff is so awesome!